SAN BERNARDINO, Calif., April 26 (SEND2PRESS NEWSWIRE) — In San Bernardino County, site selection and hiring assistance programs are helping promising new businesses launch in spite of a tough economy. The County of San Bernardino Board of Supervisors knows that a business-friendly environment is one of the keys to economic recovery and vitality and carefully invests funding from the Workforce Investment Act to bring more employers to the region. Metroll, a metal manufacturing company that makes metal roofing, siding and building kits, recently closed escrow in Fontana and plans to be fully operational within four months. What will make it unique is a proprietary software system that allows clients to create customized building plans which are then automatically conformed to the local codes and requirements, saving valuable time and money when obtaining permits and constructing the building. Anand Patel, a director of Metroll, is grateful for the site selection and hiring assistance he received through the County of San Bernardino Economic Development Agency. Business service representatives from the San Bernardino County Workforce Investment Board immediately stepped in to post Metroll’s job openings on www.csb-win.org and also assisted Patel in obtaining the necessary approvals and permits to get Metroll up and running. Patel anticipates that he will have an on-going relationship with the County as Metroll plans to hire ten new employees within the next few months and then train those workers to operate the machinery that will make roofing, siding and other structural profiles. The San Bernardino County Workforce Investment Board funds a team of 23 forward-thinking business service representatives. Each representative visits a minimum of 40 new businesses per month and maintains relationships with the businesses they have contacted. These representatives meet with business owners to identify their workforce needs, discover job openings, help with hiring and negotiate subsidized training contracts. For more information, employers and job seekers can inquire through the County of San Bernardino’s Employment Resource Centers at (800) 451-JOBS. 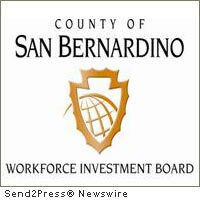 The Workforce Investment Board of San Bernardino County is comprised of private business representatives and public partners appointed by the County of San Bernardino Board of Supervisors. The Board strives to strengthen the skills of the County’s workforce through partnerships with business, education and community-based organizations. The County of San Bernardino Board of Supervisors is committed to providing county resources which generate jobs and investment. The Workforce Investment Board, through the County of San Bernardino Economic Development Agency and Workforce Development Department, operates the County of San Bernardino Employment Resource Centers (ERCs) and Business Resource Centers (BRCs). The ERCs provide individuals with job training, placement and the tools to strengthen their skills to achieve a higher quality of life, and the BRCs support and provide services to the County’s businesses including employee recruitment. Original Keywords: Metroll, Anand Patel, Sandy Harmsen, County of San Bernardino Board of Supervisors, site selection and hiring assistance, Workforce Investment Network, Subsidized Training Employment Program, STEP, On-the-Job Training, California business news Workforce Investment Board of San Bernardino County San Bernardino California SAN BERNARDINO, Calif.
REFERENCES: Business News, Metroll, Anand Patel, Sandy Harmsen, County of San Bernardino Board of Supervisors, site selection and hiring assistance, Workforce Investment Network, Subsidized Training Employment Program, STEP, On-the-Job Training, California business news Workforce Investment Board of San Bernardino County San Bernardino California SAN BERNARDINO, Calif.